Our bus arrived on time for a 7pm departure and we were shown round to it by one of the reps. This bus was a 41-bed sleeper coach, which is basically 3 rows of small reclined seats the full length of the bus, with them also being bunk bed style. There is not a lot of room to move, made even harder if you are on the bottom like we were with the ladders for the top bunks getting in the way. Your feet go into a small enclosure which is under the person in front. We chose the bottom and right at the back, hoping for it to be quieter as less people walking past you. You can recline the chair up a bit, but pointless when on bottom as can’t sit properly due to the top bunk. 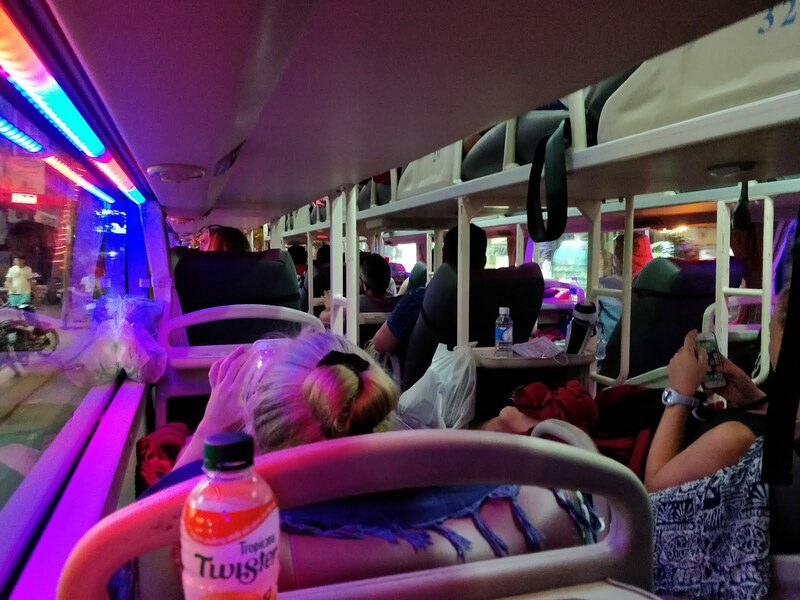 Despite having air con on the coach, we found the lower bunks have a poorer flow, and the middle row doesn’t even have any above it at all, which made this an uncomfortable and warm journey. It also didn’t help that we picked the back of the bus, nearest the engine so we got heat coming in from there too. 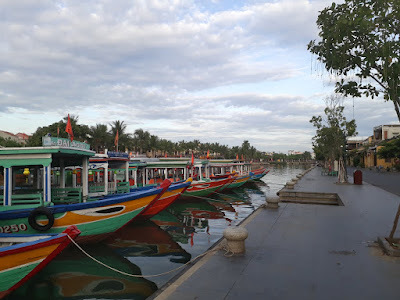 I had read that the bus stops for a couple of rest stops throughout the night, with our arrival in Hoi An due at approx. 06:00 the following morning. 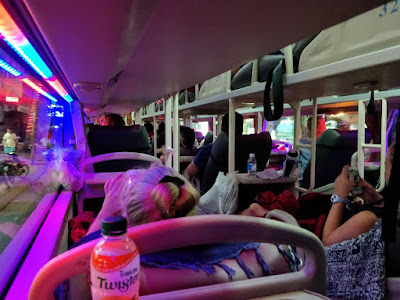 The bus was full, so we couldn’t move up to the cooler upper bunks either, so a couple of hours in and I was all for getting off and if we had stopped somewhere in civilisation, I probably would have. We didn’t stop till about 11pm, and even that was at a petrol station with nothing else around apart from a toilet, no food/drink outlets open at all. It was a quick 10-minute stop, and that was the only stop until around 4am where we let off some passengers. We quickly moved up to a top bunk where it was a lot cooler, sadly the journey was nearly over, and we pulled into Hoi An around 5.30am, obviously ahead of schedule due to lack of proper rest stops! We couldn’t check in till around 9am, we had planned to just grab a coffee for a couple of hours. As it was so early, and nowhere being open yet, we wandered the streets for a bit to waste some time. Along came a parade, yes at 6.30am with people banging drums, playing trumpets and marching along all happy… then we noticed it was a funeral procession and there was a huge ornate wooden coffin being carried by around 20 people, yes it looked that heavy! 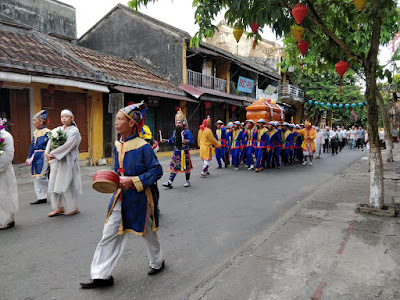 Then there was a truck which they would transfer the coffin in to, and right at the back there was the mourners, along with a lot of locals waiting to get passed on their scooters. We then walked through a busy local market, early morning is when they are at their busiest and is a flurry of people buying and selling their wares, with an amazing selection of fresh fruit and vegetables. I’d managed to find a small café that was open, so we found that and sat outside just at the edge of the market, and watched the world go by for a while. It was soon time to head to the hotel, which was about 15-20-minute walk out of the main part of town, a place called the Ruby River Hotel. As we had planned to stay in Hoi An for a week, we picked somewhere nice with a lovely pool. 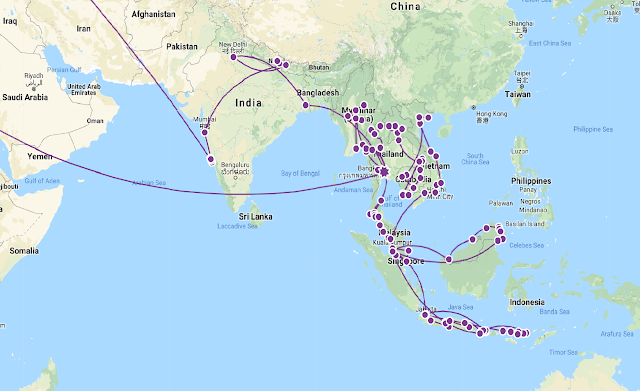 There were a few day trips out we wanted to do whilst here, plus the many wonderful places to see in the Ancient Town, which would keep us busy. Our room was huge, with the comfiest bed we have had for a while, TV, fridge etc so we were sorted for the week, along with an amazing breakfast to help ourselves to bacon sarnies! As I hadn’t slept well on the bus (probably got about an hour), we didn’t really do anything on the first day apart from laze about the room, I had a sleep and then we decided to go out for a walk into the old part of town to see what it was like. We found a little restaurant around the corner from our hotel called Nhan’s Kitchen, where we stopped for a quick beer, and amazingly cheap at only 15,000VND each (50p) so needless to say we did stop there a few times over the week, and even ate there one evening as the food was lovely. Then we strolled along the river, past bars and hotels till we got to the market that we had saw that morning. Crossing over from riverside onto the road, we were greeted with the streets being alive compared to earlier that day, everywhere was busy and the beautiful old buildings had their wooden shutters and doors open, mostly all now converted into bars, restaurants, tailors, gift shops etc. 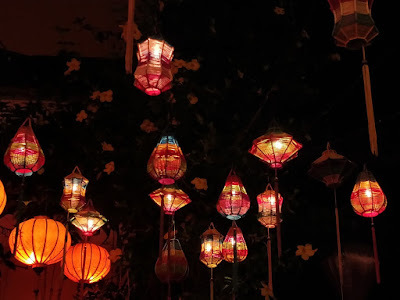 But what stood out was the thousands of colourful lit-up lanterns that decorated the streets, zig-zagging across the road from building to building, sometimes the full length of the street. Then various establishments had their own displays too, creating a wonderful visual experience that just suited this place to the ground. There was also piped music, mostly classical stuff that was being broadcast across the old town, giving it a festival feeling. Another plus point is at night, the streets of the ancient town become a vehicle free area, which is loosely monitored but you do get the odd local on a scooter wizz past. And next to the river, there are vendors selling all types of street food, locals selling floating candles, which you can then take onto a boat lit up by lanterns, cruise down the river and release your candles (sadly on wax paper) and watch them float into the distance. 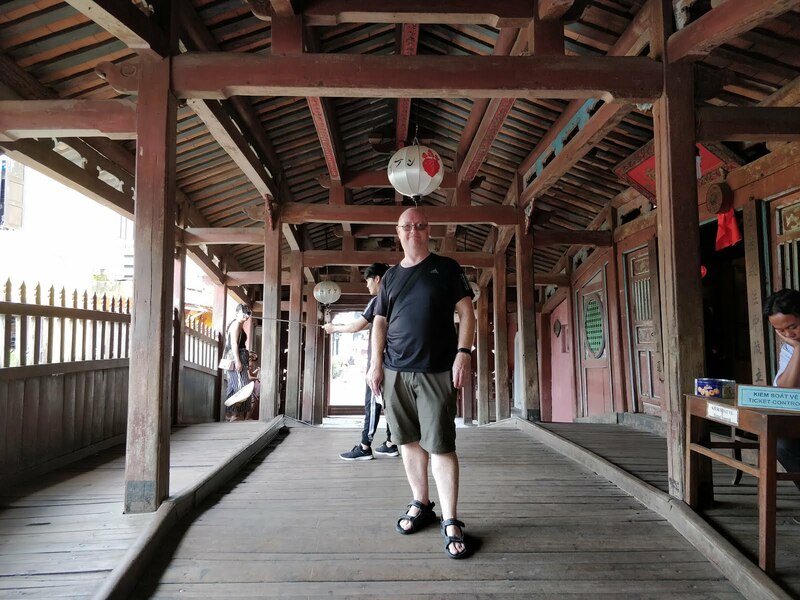 The overall vibe of the place was amazing, it was a very relaxed place to stroll around, people watch, stop for a local fresh beer, have some street food, dine on local delicacies and just generally soak up the atmosphere. Yes, fresh beer (Bia hơi) which is a bit of a thing in Vietnam, and this was our first tasting of it. Normally priced at around 5000VND (16p) for a glass, yes indeed it’s that cheap. I think the cheapest we seen it was for 4000 but can go up to 10,000 for a glass. Ok, so it’s not the strongest or best beer you will have, but it’s lovely to just sit and sip and watch the world go past… and at that price who can refuse! Apparently it is brewed daily and needs drunk quickly as there are no preservatives or additives in it, probably a bit like homebrew, and is meant to be around 3%. We found somewhere on the riverside to eat, and after that we walked over the bridge to An Hoi, which is an island containing more bars, restaurants, street food and a market. After some more fresh beers, we headed back to the hotel for an earlyish night with a new-found love for Vietnam after the shaky start over the previous 2 weeks. Most of the week we had a relaxed time of it, we had a couple of things we wanted to go and see but were pretty fluid with our plans. During the day the heat was probably the worst we’ve had during this adventure, with the real feel temperatures hitting the low 40’s, so needless to say we didn’t plan much around the afternoon times, and that we would laze around the pool and doing a bit of research on trips for Halong Bay later in the month. 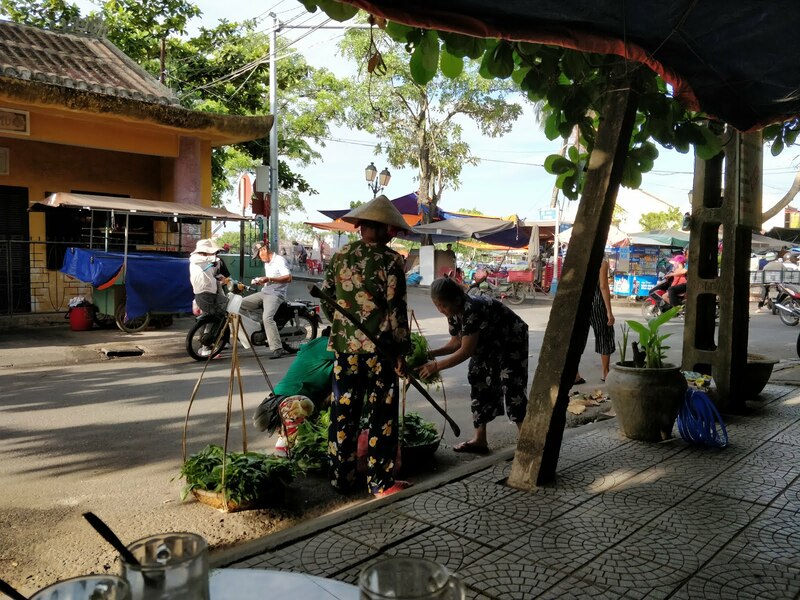 Hoi An is renowned for its amazing local delicacies and the next evening we took a walk round a few of the recommended places to try some. 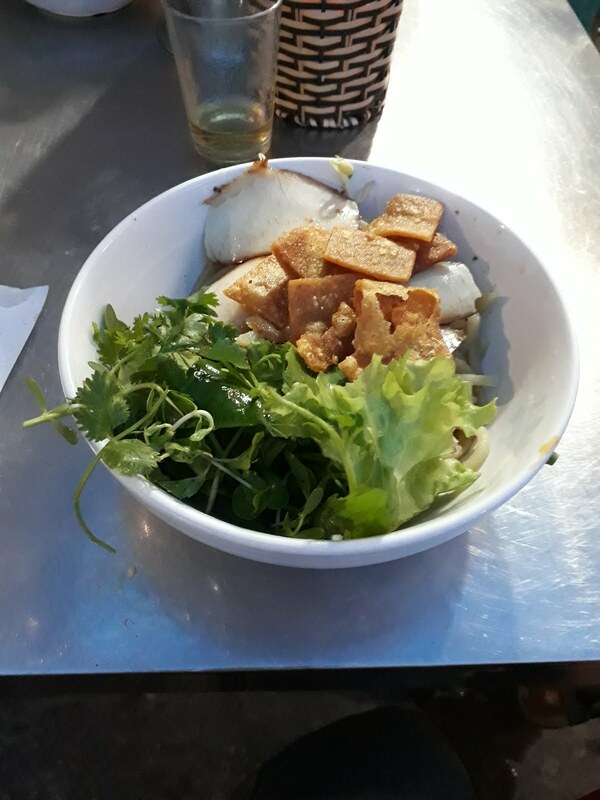 We had some Cau Lau which is a thick noodle and pork dish, we also sampled over our time in here the White Rose Dumplings which are made by only one family to a secret recipe and then sold to every restaurant in town, Hoi An Spring Rolls plus other delicious stuff. We did also have western cuisine a few times and after an evening on the fresh beer chatting to a lovely English couple about their travelling and comparing stories, we ended up at a place recommended to us by our friend Sharon Stone and had a delicious fish & chips, best one we’ve had in a long time and beats some we have had back in the UK! Hoi An is a UNESCO World Heritage site and has a well preserved old town which features many stunning buildings, a Japanese Wooden Bridge plus various museums and traditional villages nearby. The next morning, we went and got our ticket, so we could go and see a few of these, technically you are meant to have one to even walk about the town, but there is no way they can monitor this and you only get asked to see it if there is a guard at a building you want to enter. After a few buildings and a museum, the heat was just getting too unbearable, so we retreated back to the hotel. That evening we decided to eat local to our hotel and found an amazing Taco place that simply does 3 types of taco and 4 sauces, and great value too. One place we had bookmarked to go before we even left the UK was Ba Na Hills, about an hour north of Hoi An and the easiest way to get there was to book a private taxi to drop us off and then collect us when we wanted. 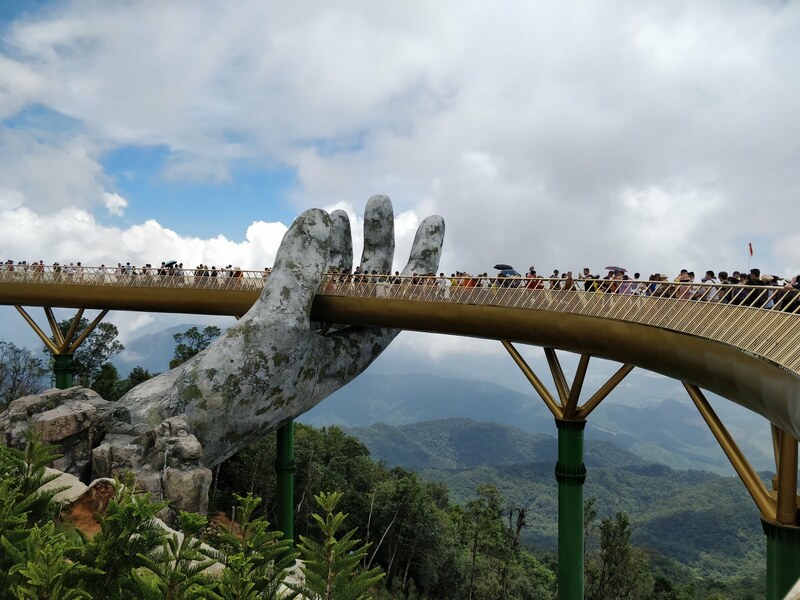 It’s a theme park resort based at the top of a hill, which is connected by several cable cars going to various areas including hotels, temples, gardens, some kids rides and there was a German Beer Festival on too! The cable cars provided stunning views of the surrounding area and we soon got to the summit and entered the main plaza looking for a coffee. Not long after we sat down, there was a performance of dancing and various other stuff, all fun to look at but very ‘Disney’ and after watching it we wandered off to have a look round. It is French themed and although most of the building facades are fake, they are done very well and must be doing well as it seems to be expanding all the time, with a new huge hotel and palace due to open next year. We spent most of morning just wandering around, enjoying the slightly cooler climate and managed to see pretty much all of it. We had also been given 2 free beer tokens for the beer festival, so went and enjoyed them along with a huge buffet style lunch which we paid less than £5 each for. So after that, there was nothing else for it but to head back to the beer festival for the last couple of hours before we had to start our descent to the base. 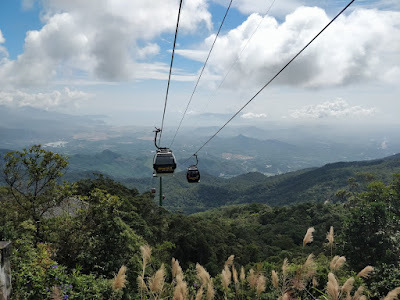 We went down on the longest of the 3 cable car routes to the bottom, this one holds the world record for being the longest nonstop single-track cable car and its nearly 6km long and takes about 20 minutes to get to the bottom. That evening we stayed local again and just ate at our regular stop, Nhans that evening before having an early night as we were exhausted from walking around all day. The next day we didn’t do much in the morning, then went out late afternoon for a few beers, cocktails and a walk along the river and into the old town again. 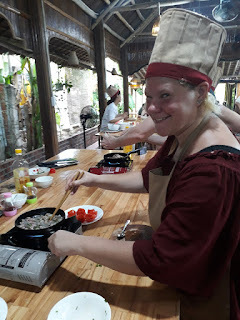 On our 2nd last day, we had booked a morning trip which included a walk through the market, then on a boat along the river to the Coconut Village, then back to a restaurant for a cooking class then lunch. We got picked up from our hotel by taxi and taken into town to the market where we met a guide who would show us round. It started off well with him explaining a lot of things to us about ingredients etc, but by half way round he seemed to lose interest and wandered off in front. Luckily, he wasn’t our guide for the full day, and after the market we got onto a boat with another couple of small groups and a girl became our guide for the rest of the morning. We went along the river towards the ocean for about 45 minutes then we arrived at the place they call Coconut Village. It’s pretty much a tourist trap, where the locals take you out on one of their traditional bamboo boats through the water coconut trees and you ‘fish’ for crabs in the reeds. It was really busy with boatloads of tourists getting on and off these bamboo boats. 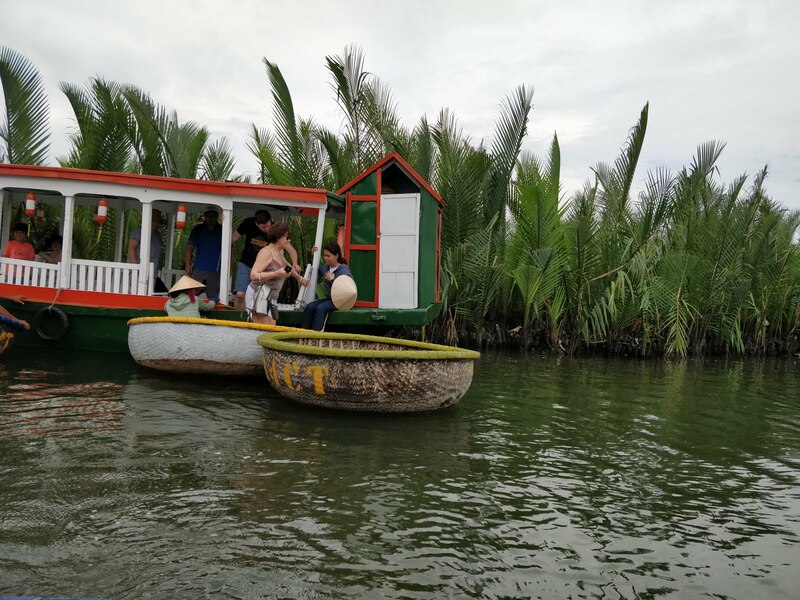 It was our turn and a little old Vietnamese man came along side our boat, so we jumped in. He greeted us with a gift of a grasshopper ring made from reeds. He also made us a couple of headdresses which he took great amusement in putting on us, swapping them over between us and generally I think he maybe had a drink or 2 from his clear water bottle. Off we went into the small rivers through the trees, where we spent about 30 minutes watching him try to catch the smallest crabs ever! I had a quick shot, we did manage to catch a couple and then they were put back in the water. After that we got on the boat again and taken to the village to wait for a car to take us to the restaurant, which was about 10 minutes away. On arrival at the restaurant, all the tables were set out into roughly groups of 4, we had been chatting to an Australian woman and son and we got paired up with them. We were making a few dishes and we would also get a few other ones that are made by other staff members, so our chef got us started on preparing a Green Papaya Salad, yes nothing too taxing was involved in this cooking lesson, but it was fun anyway. Next up was Fried Spring Rolls, which were pork, shrimp, garlic, ginger plus a few other things, then we wrapped them up in rice paper to be cooked later. We also put a few ingredients in with a bit of fish and that got taken away to put in the oven. Last up was some Hoi An Pancakes, which again had pork, shrimp, garlic, ginger and some other ingredients. All basic stuff but proved to be easy to do and we will probably try these at home sometime. So, then we fried our spring rolls and pancakes, and then it was time to eat. We got some rice and river clams to try along with some fruit after. It was all delicious and we were quite proud of our cooking and after that we got back to the hotel and hid from the heat again before out for dinner and drinks at night. On our last day we did more research for the rest of Vietnam, chilled out and went out to say goodbye to Nhans, another new little place called Firefly that we went to a couple of times, then into the old town for the last time. We really enjoyed our week here, even though we didn’t do some stuff we looked at such as visit the beach, see more of the surrounding villages etc but felt refreshed after a week in the one place, and we were both very excited about our next journey which would be on the back of a motorbike along the Hai Van Pass to Hue!